Under the Residential Proclamation made in 1920 by Strathfield Council, the building of home units was prohibited in most areas of Strathfield until the late 1960s. Following the introduction of the 1919 Local Government Act, Strathfield Council was the first Council in NSW to proclaim most of Strathfield a residential district by proclamation in April 1920, a decision approved in the NSW Government Gazette of September 1920. The proclamation applied to all land in Strathfield, except for land fronting parts of Liverpool, Clarendon (now Albert Road), Beresford Road, The Boulevarde, The Crescent, Elva and Rochester Streets, and excluded any trade, industry, shop, place of amusement, advertisements or residential flats. In the 1920s, Council required subdivisions with 50 foot minimum frontages, when most land in Sydney was divided into 40 feet frontages or less. Therefore, in many areas of Strathfield, land allotments are higher than Sydney average. The proclamation largely stayed in place until 1969 when it was suspended by the Strathfield Planning Scheme Ordinance. The result of the proclamation was that few units were built in Strathfield from 1920 to the 1960s. The few examples of units built during these years involved conversions of large houses, or units built near town centres or outside the boundaries of Strathfield Council (which were later amalgamated into the Council eg Homebush or Enfield). Station Street Homebush . Photograph Strathfield Council 1986. From 1921 to 1933, a population increase of 67.8% occurred in Strathfield in contrast to the Sydney region increase of 37.4%. During these periods, there was considerable subdivision and building activity in Strathfield due to availability of vacant and undeveloped land, especially on the former Potts and Newton lands in the Strathfield west areas. Subdivision of developed estates also commenced, usually involving reduction of land surrounding existing large homes. Most of the building activity involved houses, not units or flats. 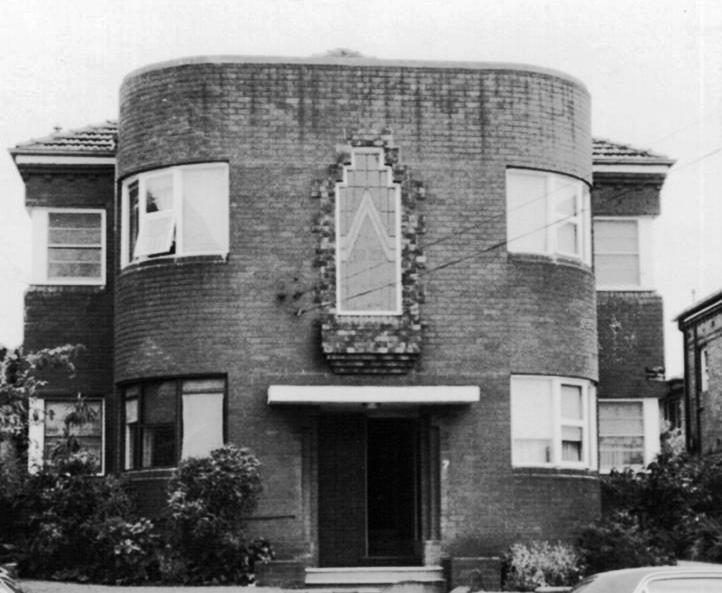 There are limited examples of apartments built in Strathfield in the 1920s and 1930s. There are rare examples in Albert Road Strathfield and The Crescent Homebush. The illustrated example of a two storey flat building in Station Street Homebush was located in the former Municipality of Homebush, which amalgamated with Strathfield Council in 1947. This block survives as a rare example of early twentieth century units in the Strathfield district. Knight Street Homebush, which runs parallel to Station Street, also contains a number of flats built in this period. These streets are located close to Homebush Rail Station. ‘Chequers’ Redmyre Road Strathfield was a two storey apartment block which was built in 1929. These apartments were located in Redmyre Road Strathfield but have since been demolished. This is a very rare example of a 1920s apartment development approved by Strathfield Council after the adoption of the residential proclamation in 1920. Glen Luna’ 2-4 Carrington Avenue Strathfield. Photograph Strathfield Council 1986. ‘Glen Luna’ 2-4 Carrington Avenue Strathfield was built in the 1880s for solicitor Dr George Sly. Strathfield Council approved the conversion of this building into apartments in 1935. Conversion of large homes into smaller separate units or boarding houses was common in Strathfield. Another more recent example of conversion of a large homes into units is ‘Woodstock’ 88 Redmyre Road Strathfield. The introduction of the Strata Act in the 1960s permitted separate title for units, allowing private ownership of separate units. Demand for housing required Councils to plan to increase housing density. 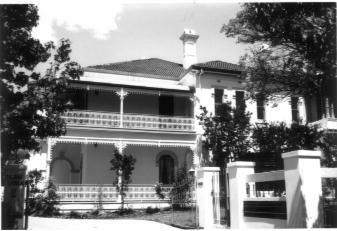 In 1947 Cumberland Country Council estimated Strathfield’s total residential capacity at 29,280 persons. A 1962 Council planning report noted that there was no further capacity or available land in Strathfield for housing, therefore additional housing would involve redevelopment of existing sites. After the adoption of the Strathfield Planning Scheme Ordinance in 1969, home units began developing in streets located close to town centres and railway stations. As most of Strathfield Municipality land is fully developed, building of new units involves demolition of existing properties, usually houses. Units of this period were generally 2-3 stories in height and without lift access, hence the name ‘walkup’ flats. From 1969, a significant amount of walkup (up to 3 storey heights) residential flat developments had been built in streets such as Albert Road Strathfield and Burlington Road Homebush. However, Strathfield Council resisted building of units with heights greater than 3 storeys. By 1981, only 81 units were higher than 3 storeys, in contrast to much higher densities in nearby Council areas such as Burwood Council. Strathfield Plaza (Churchill Avenue, The Boulevarde and Redmyre Road) development was completed in 1981 and was part of a larger commercial development, which included the Strathfield Plaza shopping centre and office tower. The residential development was the first ‘high rise’ built in StrathfieldMunicipality. This development was 17 stories in height and included 129 x 2 bedroom units. NSW Government planning strategies support urban consolidation. Urban consolidation involves redevelopment of existing sites, particularly those close to existing transport hubs and amenities, with buildings of higher density. Urban consolidation in Sydney is generally focused on developing higher densities in established suburbs with existing infrastructure in preference to development in the outer areas of the Sydney Metropolitan area. State Environmental Planning Policy (SEPP) 53 required local councils to develop housing strategies for increasing population and housing. The Housing Strategy for Strathfield (1999) involved rezoning of land for higher densities in places such as Parramatta Road Corridor, Homebush and Homebush West. In 2006, the Department of Planning’s Metropolitan Strategy ‘City of Cities – A plan for Sydney’s Future’ placed Strathfield in the Inner West subregion and produced the following targets for the subregion of 30,000 additional potential dwellings (by 2031) and employment growth target of 9910 (by 2031). Written by Cathy Jones 2011. (c) Cathy Jones 2011.